We started by trying to think what kind of things light up and I came up with lightning bugs. Then we started to figure out what goes with lightning bugs that everyone could be and we came up with a little girl catching lightning bugs in a jar. 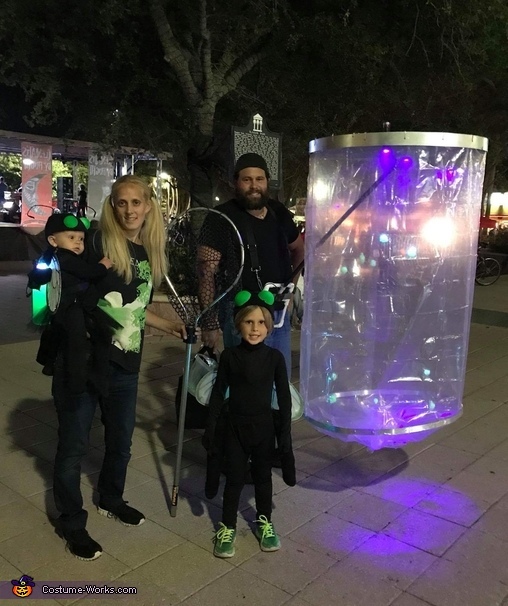 I was the little girl, my husband was the jar and our kids were the lightning bugs. The little girl was easy...little girl clothes, pigtails and a net for catching lightning bugs. As for the kids, we dressed them up in all black, made them black beanies with green bug eyes and antennas (which we cut and painted foam clown noses and used wire and ribbon for the antennas) and gave them some wings. For my little girl, I made a green and black tutu. As for the glowing tubes on the back of them, we used smart water bottles, took green highlighter markers and squeezed them into the bottles with water. We took LED blacklight/UV flashlights, took them apart and wired the blacklight LEDs into the bottle caps and glued the battery pack onto the water bottles and covered them with black fabric. The UV LED’s make the water glow bright! We took elastic velcro straps and attached them to the water bottles so the kids could wear them like backpacks. Then we also attached an elastic strap around the bottle and kids so that the bottle stayed in one place and didn't swing around. As for the jar, this was the hardest part. We took aluminum framing and bent it into a circle and made crossbars. Then we took PVC piping and made a extender to be able to wear the jar. We attached a shower curtain for the structure of the jar. We took cardboard and sprayed it with silver metallic spray paint to make the top and bottom of the lid. Then we took fishing line and glow in the dark spider webbing into balls for the lightning bugs in the jar. We took another aluminum framing and bent it for the base ring and bunched the bottom of the shower curtain for the bottom of the jar. Then we took two UV Blacklight flashlights and put them shining into the jar so that when my husband walked the lightning bugs would swing around in and out of the UV lights giving it an affect of lightning bugs flying around. Incredibly done and well thought out. Great job!!!!!! Very cool idea!!!!! Super creative!! I Love it and I love fireflies great job! So original! Love it! There's your Winner winner right there!